Everyone around me and nature. 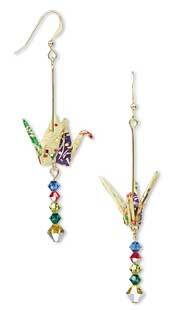 I saw someone wearing similar crane earrings but without any beads, just plain black color. Very dull in my view. It was a learning experience for the process of making. Initially the process takes about three days with painting, but I found a quicker method and cut down the process to one day. Always been interested in natural gemstones, but started beading by repairing friends and relatives jewelry three years ago. I am a multimedia artist. I paint, I do floral arrangements and do origami. I also taught classes at the community center in Pleasant Hill, California. It was a hobby initially, and became a full-time career for over one year because I lost my day job. At present, I am working full-time again. Always love to create new things. So much self gratification when people love your creations. I did participate in a few fundraising events locally. You must enjoy what you do. It can be very discouraging in the beginning. It took me three years to establish a name. View all of Stephen's designs in the Gallery of Designs.